Hangman’s fracture is a fracture of the axis in the cervical region. It is often seen with people who try to hang themselves but also occurs in sports or traffic accidents. The fracture is in most cases lethal. 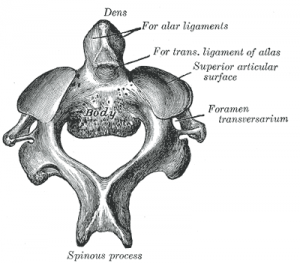 The fracture is caused by an extreme force on the upper vertebrae and especially on the dens of the axis. The fracture causes damage to the spinal cord which leads to paralysis of respiratory muscles and most often death1 . A hangman’s fracture is the result of hyperextension of the upper cervical spine. The pedicles of the axis break symmetrically and the fracture may extend across the posterior part of the body. In contrary to what everyone thinks, the dens of C2 always remains intact. The pedicles are the smallest parts of the bony ring of the axis. They are additional weakened by the foramen transversarium on each side. There is no other cervical bony injury with a Hangman’s fracture. Other tissues that may be damaged are the anterior ligament and the disc below the axis, both may be disrupted. Neurological injuries are rare because the spinal canal is sufficiently wide at this level. The mechanism of injury is a forced hyperextension of the head with distraction of the neck. This occurs when the nose is placed under the subjects chin with a hanging. Hangman’s fractures also occur in car accidents when an unrestrained passenger or driver strikes the dashboard or when rebound hyperextension en distraction of the neck. Another mechanism of injury is a sudden forceful hyperextension centered on the chin. This mechanism of injury also occur in contact sports, diving or when falling. Usually the patient has non-specific complaints of suboccipital pain. Sometimes there is a clear spasm of the neck muscles. Patients may manifest neurological deficits, depending on the severity of vertebral displacement and the presence of other cervical spine fractures. The diagnosis of a hangman’s fracture can be made using x- rays and CT scans to see if there is a fracture of C2. To determine if there is ligamentous and/or soft tissue injury a MRI can be done. There are several grading systems for hangman’s fractures like Effendi, Francis and the Levine and Edwards system. Type I: Caused by axial loading and hyperextension. There is less than 3mm subluxation of C2 on C3 and no angulation. This fracture is stable because the anterior longitudinal ligament and posterior longitudinal ligaments are intact along with the C2/C3 disk. Type II: Caused by axial loading and hyperextension followed by a rebound flexion and axial loading. There is subluxation of C2 on C3 greater than 4mm or 11° angulation. There is some damage to the anterior longitudinal ligament and significant structural damage to the posterior longitudinal ligament and C2/C3 disk. This fracture is unstable. Type III: Caused by initial flexion and rebound extension with axial compression. There is severe displacement and angulation. The injury is accompanied by C2/C3 disk dislocation and unilateral or bilateral C2/C3 facet dislocation. There is also injury of the anterior and posterior longitudinal ligament. This fracture is considered unstable. X-ray of the cervical spine with a Hangman's fracture. Left without, right with annotation. C2 (outlined in red) is moved forward with respect to C3 (outlined in blue). The healing rate can be evaluated by radiological appearance. The same system of Levine-Edwards is used for evaluating. Type I hangman’s fracture has a healing rate of almost 100%. The healing rate drops as the fracture becomes more unstable. The ‘Neck Disability Index (NDI)’ can be used to evaluate the effects of treatment. Treatment options are usually based on the stability of the hangman’s fracture. But most publications advocate that the primary treatment should be conservative. Surgical interventions are usually performed in unstable fractures or when there is a possible risk of later instability. Type IIa and III fractures with significant dislocation are almost always treated surgically. The physiotherapeutic intervention is a conservative treatment consisting of a period of traction and external immobilization. The external immobilization can be rigid or nonrigid depending on the type of fracture. The conservative treatment has more chance of being effective for stable and neurologically normal patients. Effendi type I, II and Levine-Edwards type II fractures can be treated with nonrigid immobilization alone. Type IIa and III Levine-Edwards fractures are to be treated with rigid immobilization and traction. Since literature is scare the optimal treatment is not yet clear. ↑ Yilmaz, F., Akbulut, A. & Kose, O. (2010). An unusual presentation of an atypical hangman’s fracture. J Emerg Trauma Shock, 3(3), pp. 292–293. ↑ Effendi, B., Roy, D., Cornish B, Dussault, R.G. & Laurin, C.A. (1981). Fractures of the ring of the axis: a classification based on analysis or 131 cases. J Bone Joint Surg Br, 63, pp. 319–27. ↑ 5.0 5.1 5.2 5.3 5.4 5.5 Li, X., Dai, L., Lu, H. & Chen X. (2006). A systematic review of the management of hangman's fractures. European Spine Journal, 15(3), pp. 257-269. ↑ Vernon, H. & Mior, S. (1991). The Neck Disability Index: a study of reliability an validity. Journal of Manipulative and Physiological Therapeutics, 14(7), pp. 409-415. ↑ Shin, J.J., Kim, S.J., Kim, T.H., Shin, H.S., Hwang, Y.S. & Park, S.K. (2010). Optimal use of the halo-vest orthosis for upper cercival spine injuries. Yonsei Medical Journal, 51(5), pp. 648-652. ↑ Pathria, M.N. Physical injury: Spine. In: Resnick D, ed. Diagnosis of Bone and Joint Disorders. W.B. Saunders Co.; 2002; 2964-2967.